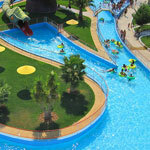 Spending one day at one of the Algarve water parks is sure a fun day; both for kids and for adults. 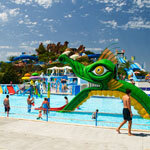 There are plenty of slides, tunnels, free falls (almost), inflatable mattresses, giant buoys, wave pools and fountains. Everything is a reason to refresh the body and enliven the day. One of Portugal’s biggest water parks, Aqualand is the perfect location for an unforgettable day out. Enjoy attractions for all ages such as Kamikaze (95 meters high), Crazy Race, Banzai and Mini Park. The biggest water coaster in Europe is in Aquashow. Featuring attractions like, White Fall, White Snake, Waves Pool and a Water Rollercoaster with a trip of more than 740 meters in and out of water. 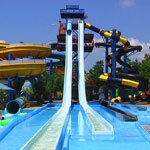 The Entertainment Water Park Slide & Splash was inaugurated on June 10, 1986. It currently occupies an area of 16.000 acres and it’s considered one of the biggest and best in Europe.